Note: This page is arranged in order of docks from North to South. Not all docks in the system are represented in the collection. I have been unable to locate a map showing the layout of the entire dock system, but I have included a diagram to show the connections between the various docks and the River Mersey at the maximum extent of the dock system. George's Dock and Basin are not shown as they filled in in 1899. Diagram showing the inter-connections of the Liverpool South Docks system. Chester Basin was situated between Pier Head and Manchester Dock and opened in 1795 as the Chester and Ellesmere Basin. It was used by canal boats and other small craft. It was filled in between 1928 and 1936. Aerial view showing the Chester and Ellesmere basins before they were filled in. George's Dock was connected to Canning Dock to the South and George's Basin to the North and opened in 1771. In 1899, both George's Dock and George's Basin were filled in to create what is now Pier Head. Small craft in George's Dock. The date is not known. Various sailing vessels in George's Dock. The date is not known. Various vessels in George's Dock. Believed to date from about 1900. The Liverpool Landing Stage is clearly not a dock but nevertheless a key part of the overall scheme of the Liverpool Dock system and is built on the river alongside where the filled-in George's Dock once stood. The location is known as Pier Head (though properly George's Pier Head) and the area is a World Heritage Site. Many landing stages have stood on the site and the most recent was opened in 1890 and supported transatlantic crossings from Liverpool. Pier Head viewed from the West - believed to be from about 1950. Rather clumsily coloured from a monochrome photo. 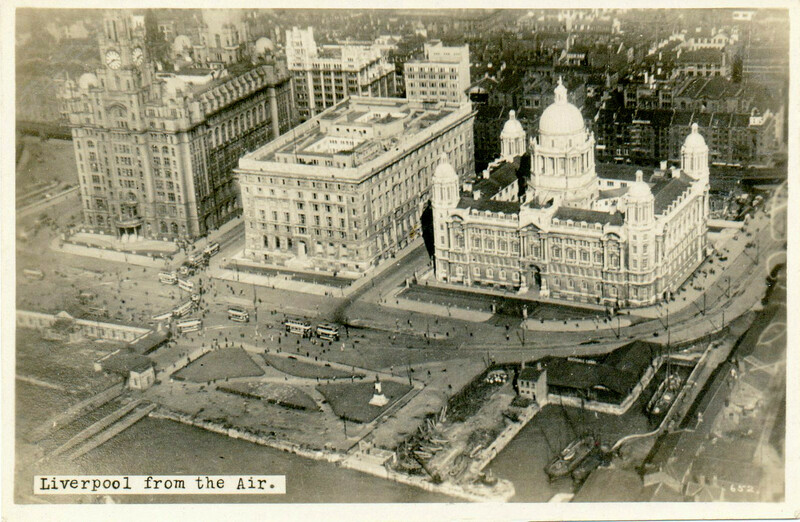 General view of the Pier Head area taken from the West - believed to be from about 1930. Pier Head, Manchester Dock and the Canning Dock entrance - believed to be from about 1930. Canning Dock is connected to Salthouse Dock to the South and Canning Half-Tide Dock to the West. It opened originally as a protected tidal basin but was completed as a wet dock in 1829. Amongst other functions it served ships involved in the slave trade. It was last used for commercial shipping in 1972 but still provides access to the Canning Graving Docks. Canning Dock viewed from Georges Dock passageway - believed to date to about 1908. An aerial view showing Canning Dock, Princes Dock and landing stages and is believed to date to about 1965. Bannrose and Ulster Drover in Canning Dock - believed to date from around 1965. An aerial view of the entrance to Canning Dock and Pier Head - believed to date from around 1930. View of shipping in Canning Dock looking towards 'The three Graces' - believed to date from around 1960. 'A busy corner of East Canning Dock' View similar to the previous image but believed to date from around 1908. Fishing trawlers in Canning Dock - date unknown. Dock Board offices in the background. Canning Half-Tide Dock lies between the Albert Dock and the Canning Graving Docks. It was opened in 1753. The George's passageway looking South across Canning Dock - believed to date to about 1908. A view across the entrance to the Canning Half-Tide Dock looking towards the Liver Buildings and is believed to date to about 1920. The building in the foreground with the flagpole in front is the 'Pilotage Building' and the small craft at the river wall is the Edward C. Wheeler steam pilot launch. The Albert Dock was opened in 1846 and was very advanced for its time. It had a complex of buildings and warehouses built from non-combustible materials and two years after it opened was fitted with the world's first hydraulic cranes. Its use as a dock declined and it finally closed in 1972 since when, after a long period of dereliction, it has become a major tourist attraction. It is connected to Canning Half-tide Dock to the North and Salthouse Dock to the East. Aerial view from Albert to Gladstone Dock believed to have been taken about 1920. Aerial view of Albert and Salthouse Docks from the south. Date unknown. Royal Navy ships in Albert Dock in 1950. It appears to be some kind of Open Day. An aerial view of Albert Dock looking Northwards. The date is not known. Salthouse Dock was opened in 1753. It is connected to Canning Dock to the North, Wapping Dock to the South and Albert Dock to the West. It was a transit point for the salt industry and exported salt produced in Cheshire. Sailing ships in Salthouse Dock - believed to date from about 1904. Salthouse Dock and the Custom House and is believed to date from about 1900. King's No. 1 and King's No. 2 Docks were two branch docks connected to Wapping Dock to the North and Queen's Dock to the South. They were opened in 1785, closed in 1972 and both filled in since then. King's Dock with grain elevator alongside a ship and cathedral in the background. Date unknown. Brunswick Dock is connected to Coburg Dock to the North and Toxteth Dock to the South. It was opened in 1832. Currently the HQ of the Royal Navy is on the dock. The grain silo in Brunswick Dock. The date is unknown. Toxteth Dock connected to Brunswick Dock to the North and Harrington Dock to the South and was opened in 1841. It closed in 1972 and was filled in with many of the old dock buildings becoming part of Brunswick Business Park. Harrington Dock was connected to Toxteth Dock to the North and Herculaneum Dock to the South and was opened in 1882. It closed in 1972 and has also been filled in with the buildings also becoming part of Brunswick Business Park. An aerial view of Toxteth Dock and Harrington Dock. The date is unknown. An aerial view of Toxteth Dock. The date is unknown. Apparently hand-coloured. Herculaneum Dock was located at the far end of the South docks and was connected to Harrington Dock to the North and included two graving docks. It took its name from a pottery company that had previously occupied the site. The dock opened in 1866 and from 1873 was handling petroleum. It was enlarged over time and eventually had four graving docks. During WW2 Herculaneum Dock acted as a terminus for North Atlantic convoys. Herculaneum Dock was closed in 1972 and filled in during the 1980s; the south part of the site was reclaimed for the Liverpool Garden Festival. Much of the main dock area is now a car park and offices have been built where the graving docks were located. The entrance to Herculaneum Dock and Harrington Dock. The date is not known. An aerial view showing Herculaneum dry docks. The date is not known. An aerial view showing Herculaneum and looking towards Pier Head. The date is not known.